Leeds became a Fairtrade City in March 2004, and has since enjoyed a wealth of support for Fairtrade from communities all over Leeds. Leeds City Council continues to support Fairtrade by serving Fairtrade at their meetings and organising promotional events, and leads the Steering Group in coordinating Fairtrade Fortnight. Additionally, both the University of Leeds and Leeds Metropolitan University have achieved Fairtrade status as well as many local schools, churches and businesses. Fair Trade is a trading partnership, based on dialogue, transparancy, and respect, that seeks greater equity in international trade. It contributes to sustainable development by offering better trading conditions to, and securing the rights of, marginalised producers and workers – especially in the South. Fair Trade organisations (backed by consumers) are actively engaged in supporting producers, in awareness raising and in campaigning for changes in the rules and practices of conventional international trade. When you see the FAIRTRADE mark on any product, you can be sure that the farmers who produced it are guaranteed a fair price for their crop which covers production costs. They also receive a premium that they can invest in projects to benefit their communities, such as education and health case. The farmers earn enough to look after their families properly and plan for the future. The Fairtrade mark can now be found on over 3000 products from more than 200 companies. In the UK the Fairtrade Foundation is the main organising and licensing body. They are an independent non-profit organisation. For more information on Fairtrade visit the Fairtrade Foundation’s website. 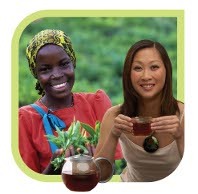 The Fairtrade Leeds website is run by the Leeds Fairtrade City Steering Group. The Steering Group is composed of representatives of the different sectors and communities of Leeds, and their mission is to work together to promote Fairtrade within the city. This work includes coordinating a city-wide program for Fairtrade Fortnight, preparing the city’s annual report to the Fairtrade Foundation, and campaigning for more individuals and organisations to support Fairtrade. If you’re wondering what you can do, the answer is simple: buy Fairtrade products, and so create a demand for them. If you go into a shop, cafe or restaurant and you don’t see Fairtrade products, ask for them! Businesses respond to the demands of their customers. If you want to take it a step further then you can get involved here in Leeds – we’re always looking for volunteers! Visit the Get Involved page for more information.